An exceptional and extremely scarce, Arts & Crafts comprehensive 15 piece dressing table set, in copper and enamel by Charles Robert Ashbee and the Guild of Handicraft; the likes of which has not been seen on the open market for a very long time and one is unlikely to ever see another extensive set like this. 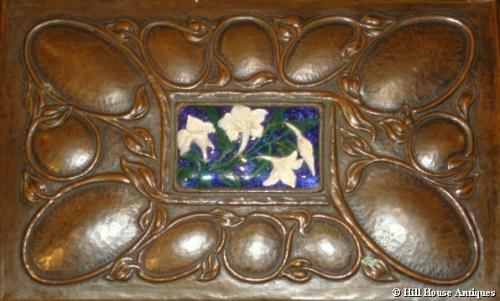 Exquisite designs to the copper, almost certainly hand chased at the time by George Hart ( one of the original silversmiths who moved with the Guild of Handicraft from London to Chipping Camden in 1902) , and most (ten) pieces with superb enameling of white (& green leafed) flowers against a deep blue background. Stamped GofH Ltd marks to many of the pieces; c1905-08. The set, until recently, has been in the same family possession since it was originally ordered, and most probably a special commission. ~ large silk lined jewellery box with chased design & enamel. The hand held mirror is illustrated in one of the original Guild of Handicraft catalogues. Other pieces are illustrated in the Guild Workshop Record Books , held by the V & A Museum in London.